I am going to the Browncoat Ball in October. It’s a weekend-long event for fans of the late great science fiction TV show Firefly. The centerpiece is a fancy dress ball. Costumes and outfits appropriate to the Firefly show are encouraged. For ladies, appropriate dress usually consists of something incredibly frilly, often with a hoop skirt, or something Asian. I’ve never gone to a Con. I’d like to, it just hasn’t been in the cards. But this event is about two miles from my house, and I’m a respected member of the fan community. I’ll be teaching a Jayne hat knitting class and I’m helping out on the steering committee. I’m definitely going. Because I haven’t gone to a Con, it follows that I haven’t dressed up for one, either. Even for this event, I wasn’t inclined to spend money on an outfit that I would wear exactly once. But in July, that changed. The Tale Of The Dress. My leg will be in its bunk. 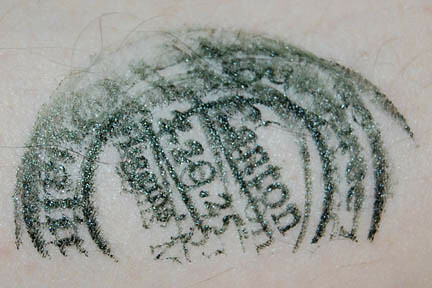 I was stamping up boxes and managed to mark my leg as originating in Canton. Oops. 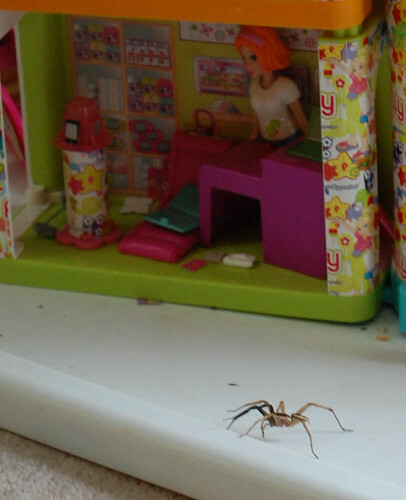 A huge spider visits my daughter’s Polly Pocket store. The little plastic people must be terrified. Well, I guess that’s it for the tomatoes, then. 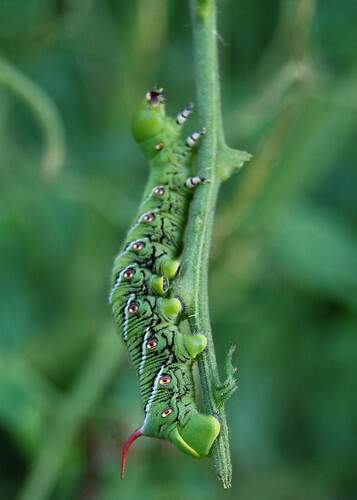 They’ve been infested with tobacco hornworms. I didn’t notice this in the afternoon, but my husband pointed it out when he got home from work. There are quite a few of these chomping away. 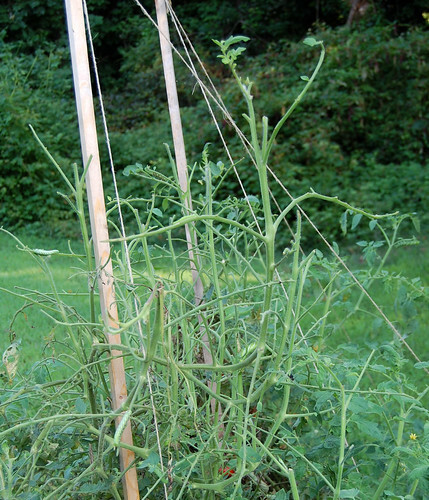 A good third of the tomato plants have been denuded. Fortunately, it was the end of the season anyway. And they’ll become a pretty moth, a Carolina Sphinx. Even though the tomatoes are goners, the circle of life is in full swing in our little garden. 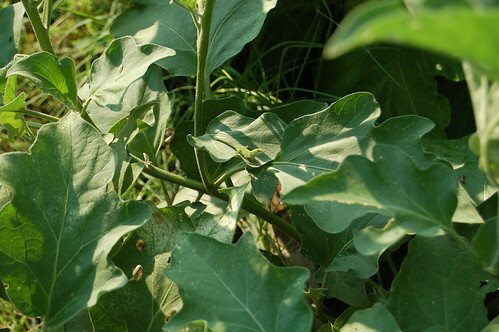 See the white things on the caterpillars below? 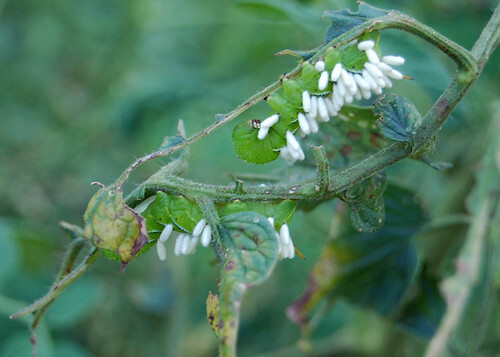 Apparently the cotesia wasp, which is tiny and doesn’t sting people, lays its eggs inside the tobacco hornworm. Then the larvae burrow through the skin and spin cocoons. Eventually they’ll consume the host. 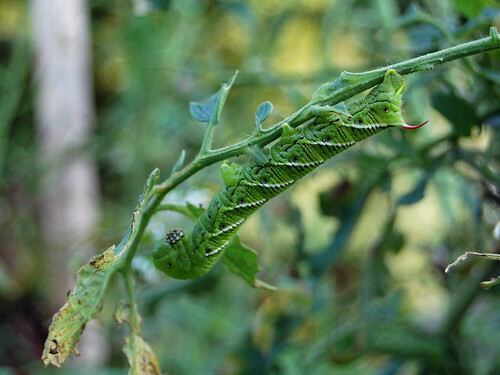 It’s a heck of a way to solve our caterpillar problem, but I suppose it’s healthier than pesticides. Well, healthier for us, anyway. 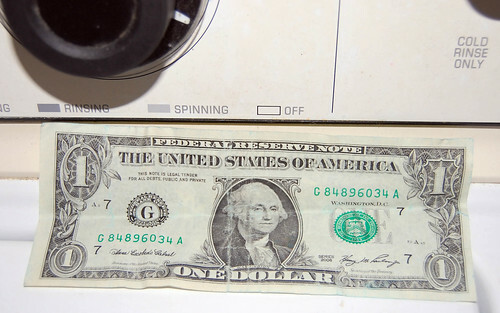 Gift from the washing machine. I went to bed last night later than I should have, which is par for the course. As I closed my eyes, I heard a little “skritch skritch” sound coming from a corner of our bedroom. I’m pretty sure it was a mouse. I got up, baited a “live catch” trap and set it. And then I couldn’t sleep, because I just knew that I’d hear the trap close, and then I’d either have to get up and get dressed and go out and set it free near the woods or I’d have to lie there in the dark listening to it scratch or ZZZZZZZZZZZzzzzzzzzzz……….. When I woke up this morning, there was no mouse in the trap. That corner of the room holds our dirty clothes hamper, and a few items had missed the basketball-like toss from across the room. It also had a few balls of wool roving (in plastic packaging) so if a mouse were going to pick a corner of our room, that would be the best candidate. I cleaned up a bit, but saw no signs of rodent activity. Was I just dreaming the whole thing? I’ve put the trap a little closer to the corner, so I suppose we’ll see. I had dreams last night that the trap had attracted ants, so now I’ve got vermin on the brain. I’m a good liberal, but the one place I have a zero tolerance immigration policy is in regard to pests entering my house. 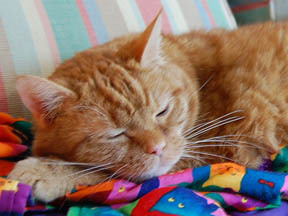 My orange striped border guard cat is a little more lackadaisical. I still remember the time some years ago when a mouse tore apart my white bathrobe in the closet to make a little nest in our linen closet. If this mouse gets into my beloved new dress, I may have to fire the cat. From a cannon. I just want a vermin-free house, is that so wrong? 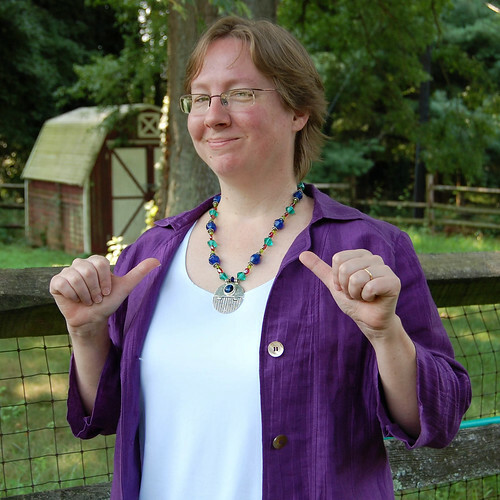 What has two thumbs and is the new design coordinator for Universal Yarn? Well, you pervy nerds will like it. So very NSFW with its bad language. We have a friend in the garden. Can you see it? Not bad camouflage. How about now? 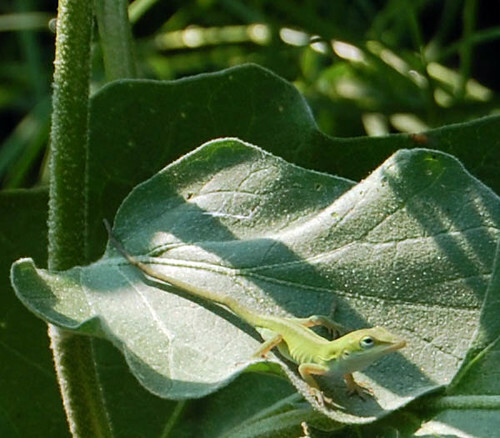 This tiny little lizard no bigger than my finger was leaping among the gigantic eggplant leaves when I went to water this morning. Feel free to stay and eat all the bugs you want, little buddy. 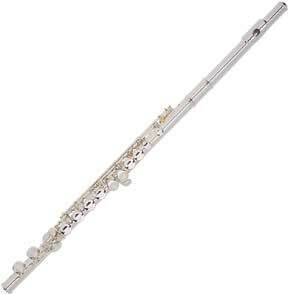 Em is playing flute in the band this coming year. Today, we rented an instrument. The kind gentleman at Howren Music was showing us used flutes and we talked about how far we could get the price down on them. Then he asked what school we were going to. I told him, and he said, “Ah.” The used flute disappeared and a new one came out of its factory packaging. Apparently there are some programs which require a certain level of instrument. He said, “If I send her over there with one of those other flutes, I’ll hear about it later.” So we wound up with a new flute and the book and DVD set which they’ll be using at her new school. Fortunately, it’s not that much more expensive. This whole experience of moving from a Title I school to a somewhat more upscale school has been very interesting.